The last College Football Quest trip of 2018 was supposed to be a Friday / Saturday double header in Dallas with a Friday night at SMU and a Saturday at North Texas. Then tv got involved and the Saturday game became a Thursday night game. Fortunately, CFQ HQ had not yet booked our flights, but all of a sudden a normal Quest weekend trip became a convoluted mess. CFQ HQ decided to continue on with the double header anyway. After switching around some hotel bookings, we had a very atypical Quest trip leaving on Wednesday night coming home Saturday. But as always, thank you to @ESPN for really messing up our well researched and coordinated travel plans. I really do think I have a future as a travel agent, if there is a future in that. Are you hiring Randy? As you just read above, it was a Wednesday evening departure to Dallas. Unfortunately, our Southwest flight had us leaving from the central terminal at LaGuardia, which as you all know, is the worst terminal at the worst airport. And unlike leaving at 6am, an evening departure adds the additional element of central terminal traffic to the mix. The central terminal is undergoing a 10 year redevelopment project that will take 50 years and fix 5% of the problems. So for the next 50 years, traffic will be 500x worse than normal. So while it used to take 30 minutes to get from the parkway to the terminal, it can now take over two hours at the best of times. 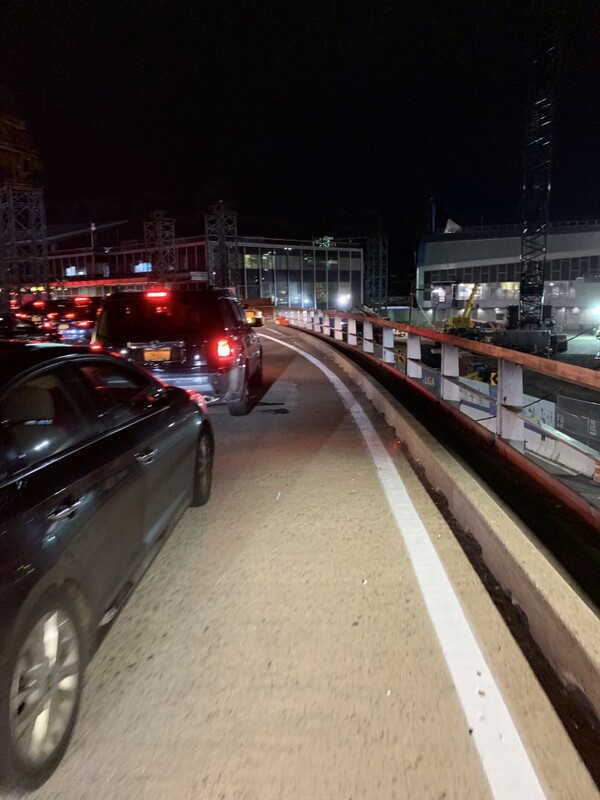 Most readers probably heard Al cursing as he sat in this traffic on his way from New York City. I came from my home and decided to leave prior to rush hour and have a seat at a bar at the airport. I hate traffic. I would rather spend time at a LaGuardia bar than sit in traffic, although it is a close call. I had a pizza and beer at Six Blocks Cafe at LaGuardia airport. And if you find yourself at LaGuardia with time to kill, do not do it here. I will set aside the pizza because I kind of got what I deserved, ordering a veggie pizza at an airport. Of course it sucked and the veggies came from a can. So I deserved that. But how do you screw up a bottled beer? By serving it warm with a dirty glass, that’s how. Yuk! The only interesting part of the meal was the tracking of Al’s Uber ride to the airport showing the immense traffic he was in and my mental bets of at what point he would get out and walk since he could see the terminal. Southwest did have a flight to Dallas leaving first thing in the morning. Al would eventually make it and for those of you thinking he would learn his lesson, you must be new around here. Our flight to Dallas was uneventful as Southwest is getting much better at the counting thing. The Silvercar pickup at Love Field was excellent with curbside pickup at the terminal. And in no time we were on our way. If you have not read my previous praise of Silvercar, you should. I am a huge fan. I will say that Silvercar has raised its service fees and reduced the amount of credit card discount that I can get which has made it pricier, but I am still a big fan. I do not think I will be blindly reserving Silvercar whenever I fly to a Silvercar location and I may compare the price a bit more closely, but it is still by far the easiest, most convenient car rental experience. We headed off on the relatively short drive to Denton. As we began passing fast food places on the side of the road, Al realized that he needed a bit of something since he had no time to eat anything at LaGuardia. It was not long before we realized we were in In-N-Out Burger territory and we had a few minutes before they closed. A bit of something turned into an In-N-Out meal, at least for me. 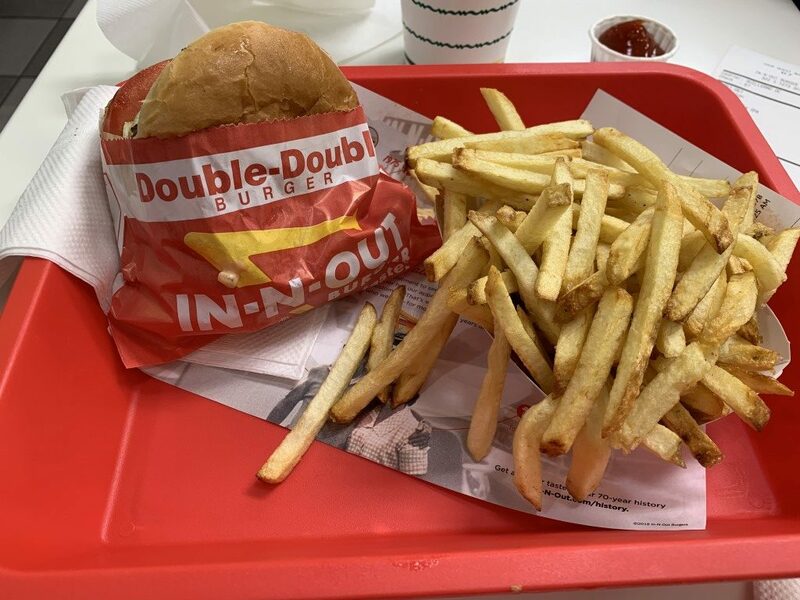 There is no close second in terms of best fast food burger to In-N-Out and I highly recommend the animal style. See the pics. I am not sure how wise this meal was at 12:30am, but it is not often we are in In-N-Out territory. After a very hefty meal, it was off to the hotel and some sleep. Thursday morning came and the plan was to drive 30 minutes for an early lunch with someone that I went to UF with, that is the University of Florida for the uninitiated newbies, you know, the hat I wear all the time, and the shirts I wear almost all the time. Well, I did actually go there, and I did actually know some people there. And even stranger, some of them even knew me. And stranger still, some of them even follow this Quest and read the web site. And when we released this year’s schedule, Lynn, who lives in Dallas, reached out and suggested that we get together when I was in town. So last week, we set it up. She suggested that she could come to Denton or we could drive 30 minutes to her favorite BBQ place. 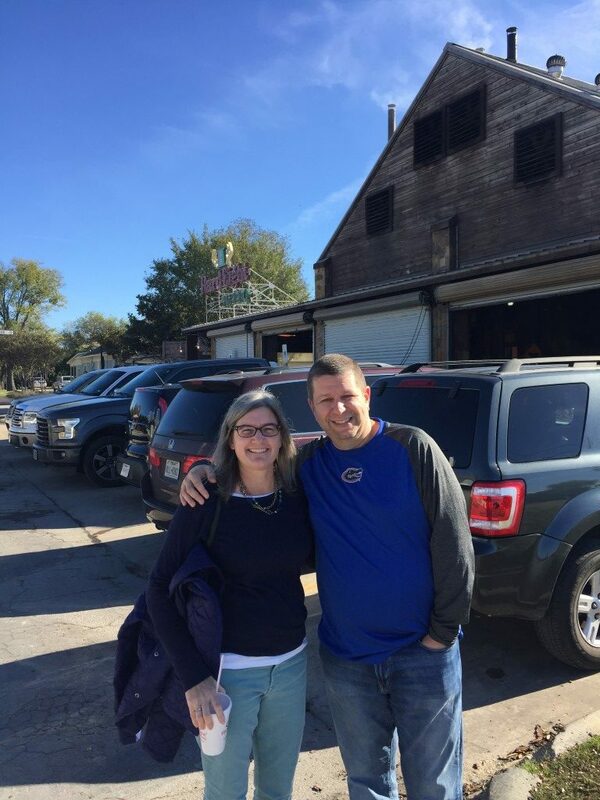 Those that follow us know that a 30 minute drive does not scare us and BBQ is one of our favorites, so that was an easy call, even with Al’s gout, which is still around. 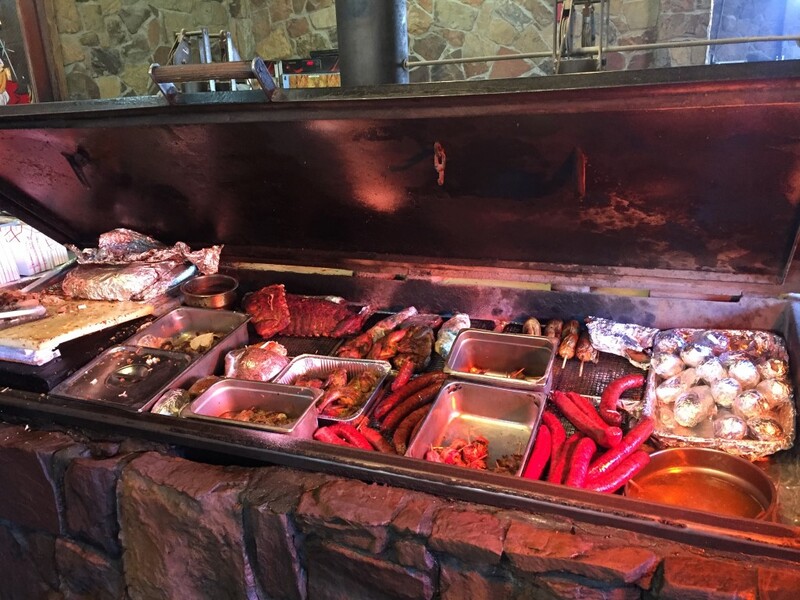 So we headed out on the road to Hard Eight BBQ in Roanoke, Texas. First off, got to love the name Hard Eight. And if there was any doubt that it meant what we thought it did, that was solved by the pictures of dice on the wall. Second, love the concept of the place. Your first stop is the meat pit where you pick your meats. All the meats are in this one central smoker like thing and they carve off what you want. And it is all by the piece. So you can get one rib or a whole slab. One slice of brisket or a whole mess of it. Love that idea. Then you proceed inside where you pick out your side dishes and then your desserts. Yes, that is plural. By the way, they will also do a whole ribeye if you want. The food was excellent. It was very nice to catch up with Lynn and hear all about her and her family. If I may be nostalgic for a sec, it really is a shame how we lose touch with people that we used to spend so much time with. Yes, I do realize that we only have ourselves to blame, but that is life. Jake, this would have been your best opportunity for embarrassing stuff about your dad. Going to grandma and grandpa was not the best play. Beth thinks I should give Jake Lynn’s phone number, not gonna happen. Lynn, I look forward to your eventual trip to New York but at the very least at some point in the future we will be back in the area for TCU, although I have no idea when. But as you are much more nomadic than I, who knows where you will be living in a few years time. Eventually lunch came to an end and we headed out to the University of North Texas. We arrived at UNT and headed directly to the bookstore for our usual shopping. 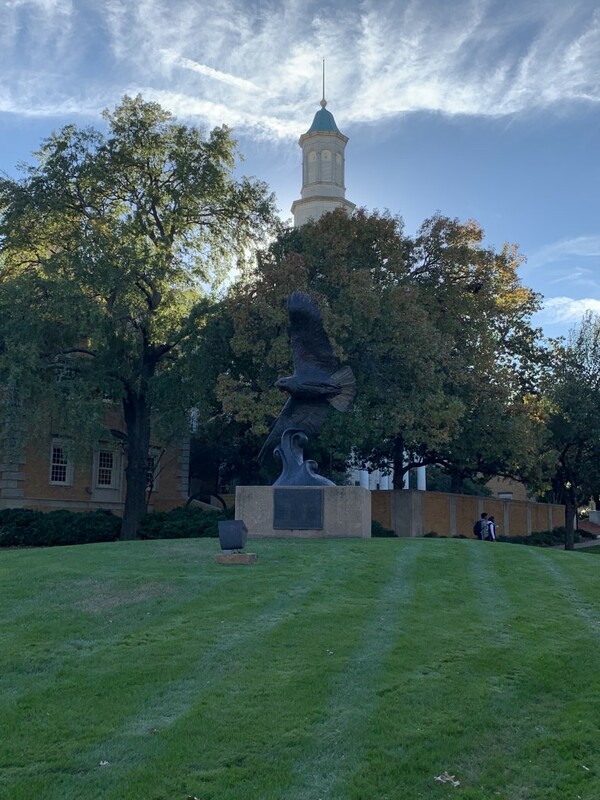 After the usual purchases, and me being very happy that I was able to find a suitable shot glass after two trips this year where I was unsuccessful, we headed out on a self guided tour of the UNT campus. 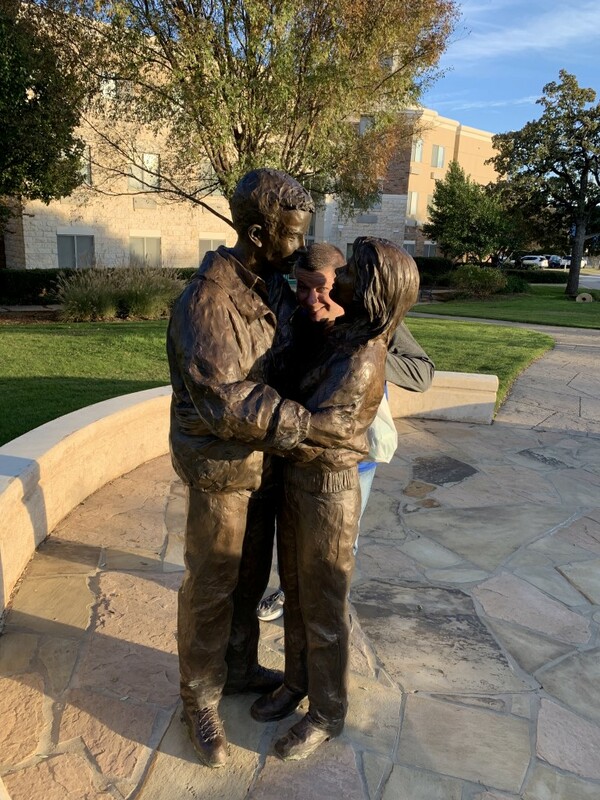 After our most excellent self guided tour, we did a quick drive through the Denton town square and headed back to the hotel for some layering before heading out to the game. Now, a note about the weather. Early in the Quest, we did not pay too much attention to the weather. We built our schedule and away we went. But games at Maryland and Northern Illinois in November and other games freezing our a** off, taught us that weather is a factor. So we generally try to start the season in the north and work our way south, spending late October and November in places like Texas, Florida and California. I do not like seeing weather reports like Texas could get its first snowfall before New York. That does not make me happy. The gameday weather reports were not what we had in mind when booking this trip to Dallas. I do not want to be layering in Dallas. But there we were, in the hotel, putting on layers. We might as well have been in Wisconsin in the snow, like next year. Off to the game we went. Seriously North Texas, $30 for parking. I know that the Cowboys have completely blown the price scale for parking fees in Dallas, but you are North Texas. Charging $30 for parking is a bit outrageous, and if you pay cash its $35. I guess they assume the attendants will steal $5 of every admission so they need to charge more for cash? I think UNT is getting a bit greedy here. 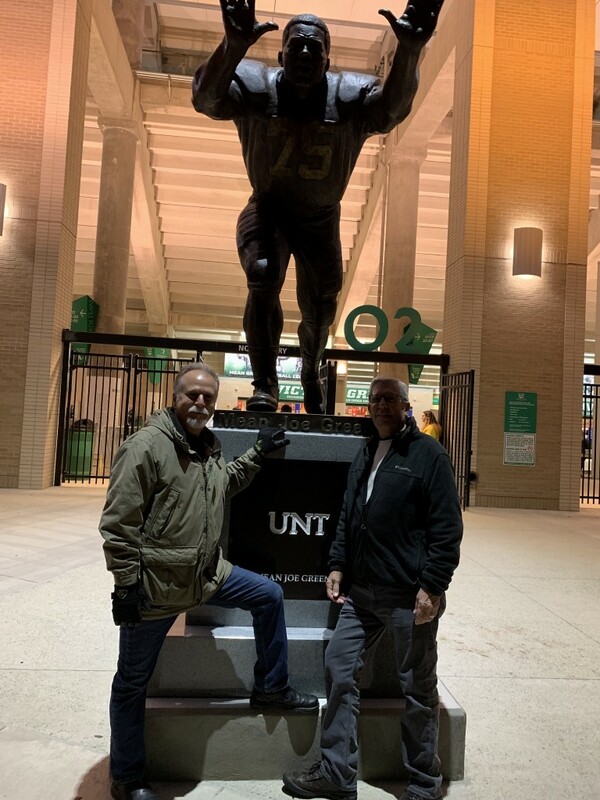 We met up with Vinny and Bobby in the parking lot and walked around the outside of Apogee Stadium to get to the Mean Joe Greene statue. I have to say, the action was quite robust for a Thursday night, IN THE COLD. There was quite a bit of tailgating, the North Texas band was out in force, there were many food vendors, and there was live music playing on a stage set up in the tailgate area. Nice job, North Texas, nice job. This was an impressive effort. 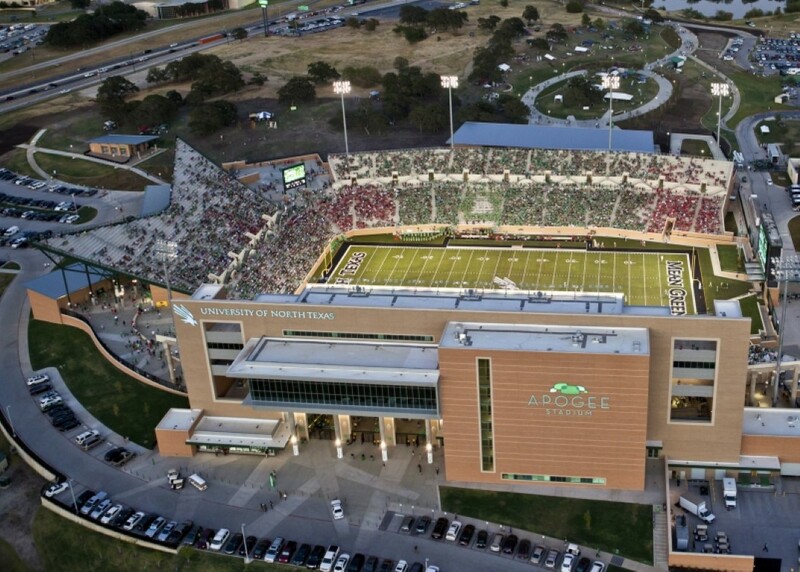 We made it around to the Mean Joe Greene statue and then entered Apogee Stadium. We spent some time wandering around the building and trying to find anyone who could correctly pronounce Apogee or even tell us what Apogee is. 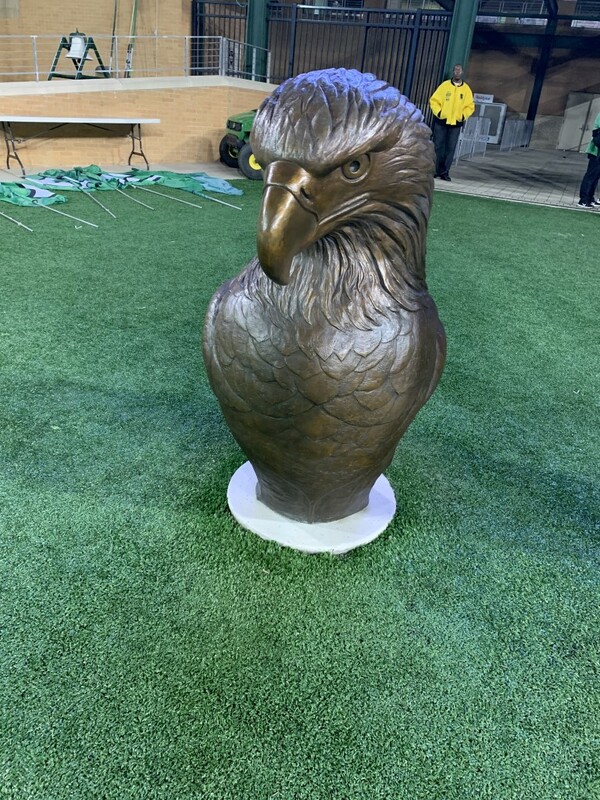 We even debated the merits of the eagle tail design of the end zone stands. Anything to stay warm. It should be noted that the Quest fell on the sword and sat out in the cold with Vinny and Bobby when nice warm seats were available to us. We will be calling in that chit. 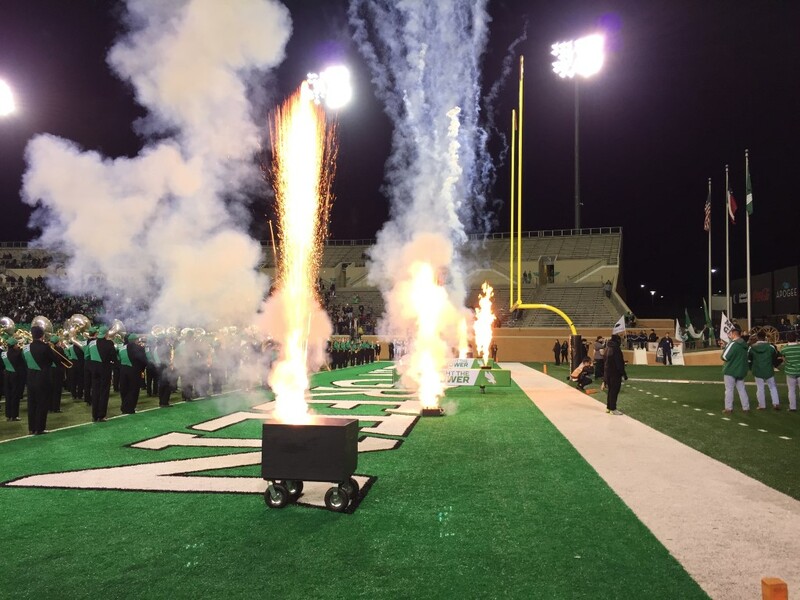 Time did come for the teams to enter the field and North Texas did so with a grand fireworks display. It was a glorious entrance and I am not just saying that since they were playing FAU and I am not a Lane Kiffin fan, and before anyone else can chime in, I will add myself, that is putting it mildly. Both Al and I picked North Texas and the game kicked off. North Texas got off to a soaring start, stopping FAU three and out and then driving for an opening possession TD and a 7-0 lead. NT would then stop FAU on its next possession on a 4th down at around midfield. This stop would lead to a NT field goal and a 10-0 lead. Thee plays later and negative yards, FAU was punting. 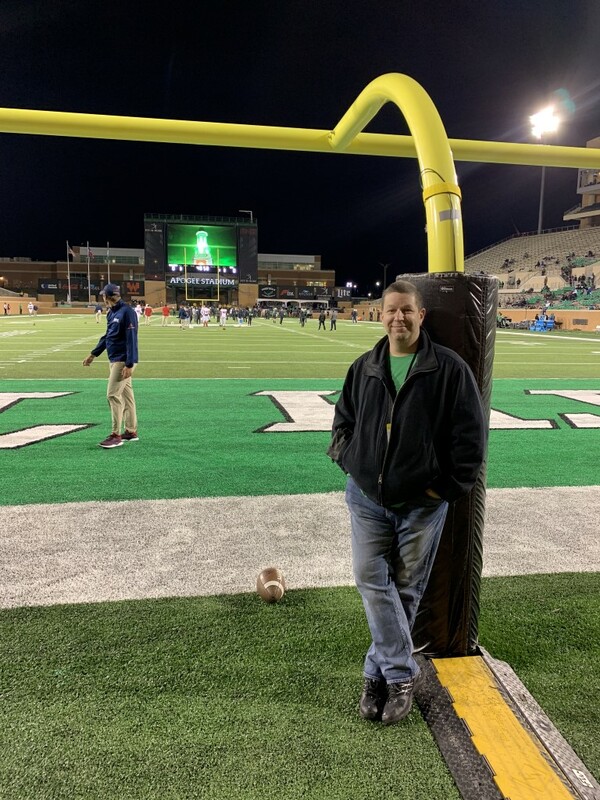 It would only take three Mason Fine passes for UNT to go up 17-0. UNT had 218 yards of offense in the 1Q, with 210 being via the pass. 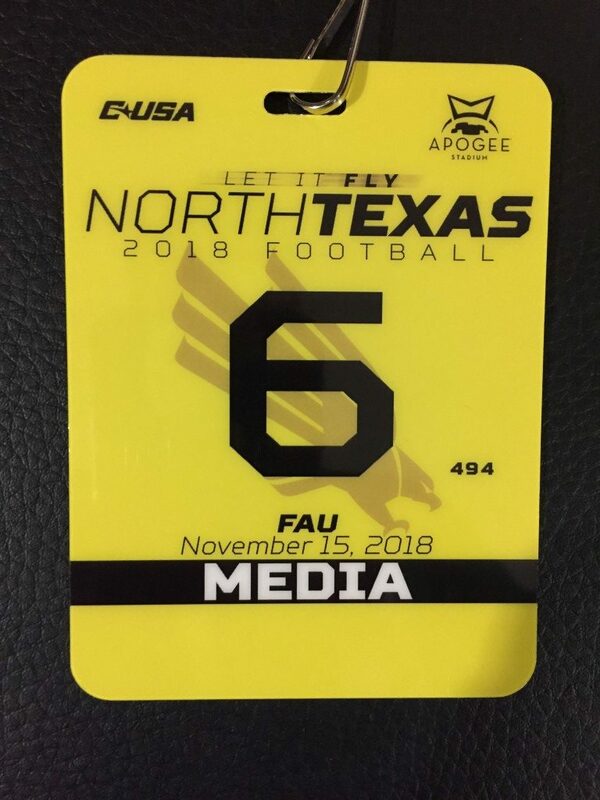 But with UNT focused on stopping FAU’s excellent rushing attack, FAU was able to stop the bleeding and get on the scoreboard at the end of the 1Q via a 56 yard pass and we would end the 1Q at 17-7. UNT would respond with a FG to go up 20-7, but FAU had solved it’s offensive woes and marched down on a 10 play drive to cut the lead to 20-14. After a Mason Fine interception, it took one play for FAU to seize the lead 21-20 with 10 minutes left in the half. And then the defenses woke up. Both teams were able to get multiple stops, in a game that did not have many of them. We would go into the half at 21-20. FAU opened the 3Q scoring after a Mason Fine interception, with a FG to take a 24-20 lead. The next drive would be crucial as Mason Fine would go down with a hand injury that would require stitches. He would return, but backup Quinn Shanbour rushed for TD to put NT up 27-24, a lead that would be challenged but not relinquished. This next stretch was the crucial aspect of the game as FAU was intercepted on its next possession and NT capitalized with a TD on another Quinn Shanbour run, taking a 34-24 lead. FAU would respond with an 8 play drive to cut the lead to 34-31, but they would get no closer with NT winning 41-38. It was a hard fought back and forth game. NT came out firing and jumped to the quick lead but FAU was able to respond and battle and force NT to play from behind for a stretch. But NT was able to respond. 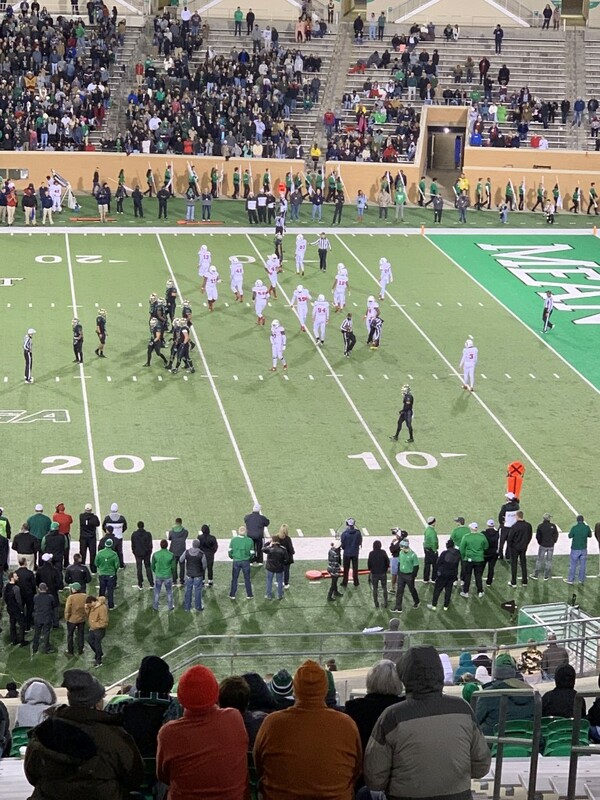 The fans were into the game and there was a nice showing from the North Texas student body who came out for the game despite it being 40 degrees and a Thursday night. The only thing that would have made the game better would have been if Lane Kiffin was not crying to the officials after every play. It is a good thing we were not behind the FAU bench because I most likely would have been thrown out. Beth adds, “No way, not you!” Lane is such a baby. After the game, Vinny and Bobby convinced us to drive to Oklahoma to “visit” Winstar casino, the largest casino in the world, according to Bobby, who is slightly less reliable than Singerpedia. This is evidenced by his statement that it’s only 20 minutes and it’s exit 1. By the way, it’s 40 minutes and it’s only exit 1 if you get off at exit 1 and drive along the highway until you get to exit 3 in another State. So we drive to Winstar casino, which is not so much a casino as a legal extortion racket. So many problems with this place that I do not know where to begin. First, the alcohol stops serving at 1:30. You know this is a casino right? And by the way, it was about that time that we got there given the 40 minute drive and time of the game. You do realize you make more money when the gamblers drink right. Second, the gambling is 24 hours, but there is no food open except the candy sold at the smoke shack. I will leave it to you to figure out why that is a problem. Third, there were very few tables open. The world’s largest casino had two craps tables open in the whole place. Two! Fourth, you have to make a donation to the Indian tribe for every hand that you play. So, if you are playing blackjack, at let’s say $10 per hand, and the donation is $0.50 per hand, that is 5% more of a house edge, in addition to the normal house edge. As if the house edge is not high enough. Even at $25 per hand, that is an additional 2% house edge. There is simply no way for the player to win in this scenario. The players are getting ripped off. As if a casino is not like printing money as it is, this is absurd. Of course, Al won. I played the craps machine to kill time, since there were only two craps tables open and they were packed, and I actually left up a little bit. So take that you crooks. Windstar, not worth the drive, but we did get to spend a bit more time with Vinny. Bobby, you ask? That degenerate was slumped over a slot machine somewhere. Hi Bobby! It was a long drive back to Denton at 3:30 am. But at least we can say we were in Oklahoma. Florida Atlantic finished 3-5 in Conference USA East which was 5th place. The Owls had a chance at bowl eligibility but Charlotte dashed those hopes with a field goal with 0:25 on the clock in the final game to beat FAU and drop the Owls to 5-7, sending them home for the holidays as opposed to a bowl game. Fortunately for the Owls, home is Boca Raton, Florida. 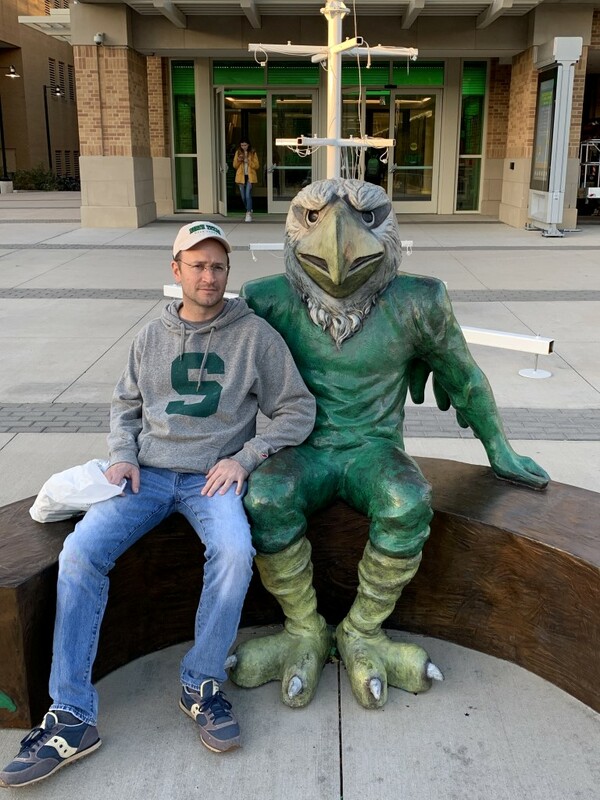 This trip report continues in the SMU trip report. For our North Texas photo album, Please click here. You can view as a collage or run as a slideshow. There are comments to explain what is in the photo but most are self explanatory. Thanks to Google, I can no longer embed the slide show with comments.